They have 10 SUPERFOODS available as of now, in 5 fruit and 5 chocolate varieties. I was sent the Dark Chocolate Banana variety, but I also really want to try the Dark Chocolate Covered Mulberries, Dark Chocolate Cacao Nibs and the Dark Chocolate Goji Berries. They all sound delicious! Each SUPERFOOD is organic, nutrient dense, preservative and artificial flavor free and just plain GOOD for you! Bonus! 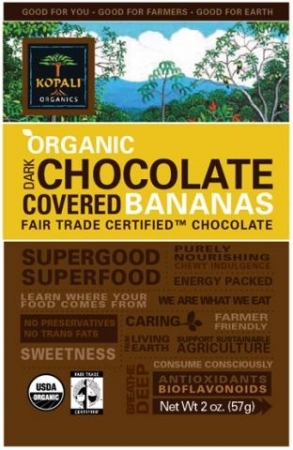 When you buy Kopali’s products, you are supporting sustainable farmers, their communities and families too. Nice! The Dark Chocolate Covered Bananas were purely excellent. In the bag, there are little “blumps” of chocolate covered pieces. They are not slices of bananas, but rather resemble the candy Raisin-ettes. However, there are some big chunks, some almost as big as a cotton ball, which made me rather happy 😀 . Upon opening the bag, the chocolate smell is very strong and pure. The Dark Chocolate had a mellow flavor, which I like, because I prefer milk chocolate over dark. I liked to let these melt slowly in my mouth, letting all the sweet and smooth chocolate dissolve until just a piece of banana was left. The banana piece itself is dried banana, so it’s chewy. It has an overall mellow banana flavor, but is also slightly sweet. It goes perfectly with the chocolate. I’m giving these 5 stars for taste, nutrition, the fact that they help the planet (woo!) and the portion size. You can eat a whole bag for only 240 calories 🙂 Chocolate lovers rejoice! Organic Dark Chocolate (Fair Trade Certified) (evaporated cane juice, unsweetened chocolate, cocoa butter, soy lecithin, vanilla), Organic Banana (dried banana, rice flour).